Zenpukuji-gawa River seen from Ozaki Bridge. In Japanese songs cherry blossoms are often described as looking like "mist or clouds". Those who have not seen cherry blossoms in Japan might think that this is just a poetic exaggeration. No, this is a very faithful description of cherry blossoms in their full bloom. 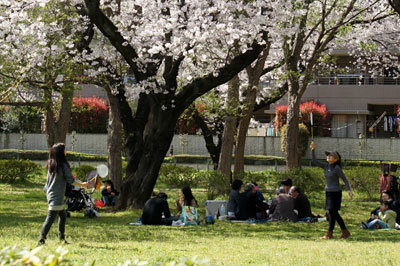 Apprediating cherry blossoms and enjoying lunch; a typical scene of a family at cherry blossom viewing. The spring landscape with cherry blossoms blooming like mist or clouds, which the Japanese people are very fond of experiencing, was realized by the invention of the species "somei-yoshino" only about one and a half centuries ago (cf. refer to the previous article.. Somei-yoshino is a hybrid cherry and cannot bear healthy seeds. Therefore, all somei-yoshino trees are clones and somehow short-lived for large trees. They seldom live longer than 60 years. However, I believe that it was a long-standing wish of the Japanese people to see cherry blossoms as gorgeous as pale pink mist or clouds hanging over our home town. Somei-yoshino realized such a dream, but sacrificed the length of its full blooming period as well as its life span. 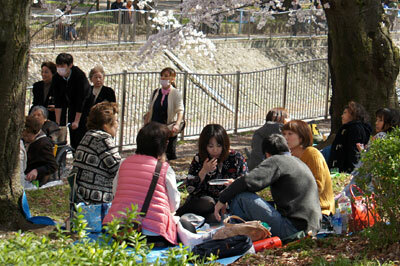 I should say that cherry blossom viewing is one of what the Japanese people miss most while they are abroad. I recently came back from a three and half years' stay in an East African country just in time for cherry blossom viewing. Therefore, I could renew my conviction that cherry blossoms are really fantastic and belong to the very best of our culture. I am happy that I am now retired and have plenty of time to appreciate cherry blossoms in a good weather condition. As the period of full bloom is very limited, usually less than a week, the best time for cherry blossom viewing does not always falls on a weekend, when businesspeople have only possibility to go out to see cherry blossoms under warm spring sunshine. Branches of cherry trees cover the pedestrian roads like tunnel. It is often the case that heavy rain falls or strong wind blows over a weekend and takes us the possibility to go cherry blossom viewing with friends or family members. This year, the best day for viewing was Wednesday and I could enjoy cherry blossoms along the Zenpukuji-gawa River to my heart's content. 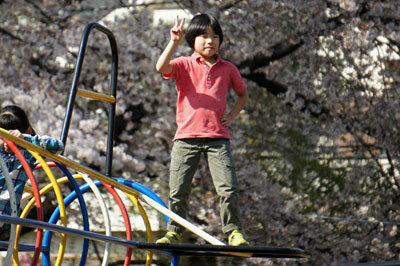 A young boy posing for his father's camera in front of cherry blossoms. Of course, most of the viewers were old people and mothers with their small children. However, I was surprised to see rather many young men among the crowd. I could not imagine that so many young men have time to go cherry blossom viewing on a weekday, as there was virtually no such possibility for me while working. It is also amazing to see so many children playing under cherry blossoms, as Japan is now suffering from aging and media keep telling us about the negative aspects of the aging society. Even though politicians and responsible bureaucrats recognize the seriousness of the fact, no effective counter measures seem to have been taken and the Japanese population have been decreasing four successive years since 2010 and decreased from its peak of 128,084 thousand in October 2008 to 127,083 thousand in October 2014. The decrease of population is coupled with stagnating economy. Because the number of people, in particular young people, is decreasing, the consumption stagnates. The stagnated consumption dampens the performance of enterprises, who are not capable to employ more workers and pay more salary. As a result, young people are impoverished and do not feel sure to start family life and bear children. A little girl trying to fly a kite. The only remedy for this is the increased acceptance of foreign migrants. However, this idea appears to be a taboo in Japan and everybody just talks about support of mothers and young families by providing them more nursery facilities and direct financial help, which seems to offset the population decrease only party though. Good place also for playing badminton. Our neighboring countries, including the big China, is suffering from the decrease of birth rate and they are following the path Japan has been proceeding. Therefore, we have to start to attract young migrants from the nearby countries as soon as possible, so that it is not too late. Despite such gloomy prospect, the fields next to cherry trees were filled up with children and young people. Such a view could be seen in many places around Tokyo on this first day of April. The view around the Zenpukuji-gawa River is still very peaceful, compared with some popular cherry blossom viewing places in Toyo. But, some 680 cherry trees are planted here 4.2km long along the river and the local shop federation wanted to take advantage of the cherry blossoms and recently started "Spring Festival in Full Cherry Blossom Blooming" and members of the federation open their stalls. The only problem is the difficulty to forecast the days of full blossom. This year, they missed the full blossom by two or three days and the festival took place with half petals fallen and green leaves gown up between blossoms. Colorful tulips are also blooming and people are posing in front of them.